The G20 Needs to Prepare the World for Rising Numbers of 'Climate Refugees'. This T20 Policy Brief shows that international policy and law build on the false assumption that displaced people and refugees can return to their place of origin when conditions improve, conflicts subside or homes are rebuilt. This cannot hold for many of those affected by climate change, and global governance of migration and flight needs to adapt. Ecologic Institute founder R. Andreas Kraemer coordinated the drafting of this T20 Policy Brief, and Katriona McGlade contributed. The Policy Brief is available for download. The global governance of displaced and trapped populations, forced migration and refugees is not prepared for the effects of climate change. Because there is no other organisation, G20 has responsibility to prepare, push for reform and initiate reviews to assist climate mobility, and G20 Summits should have Global Change and Migration as a regular item on their agenda. Following commitments made in 2016 in Hangzhou, this T20 Policy Brief argues, the G20 should establish a process of continuous communication, policy coordination and reflection on climate-induced forced displacement and migration. G20 should review progress at its annual summits. The German G20 Presidency should firmly establish this issue in G20 work streams, and provide for effective follow up as well as preparation for future presidencies. Germany should help the subsequent two G20 presidencies of Argentina and India to continue and institutionalize relevant work streams. T20 or "Think 20" is a network of think tanks in the G20 countries, and 15 experts in 12 think tanks in 8 countries contributed to this Policy Brief. When Their Home is Submerged – Who will take the climate refugees in? Kraemer, R. Andreas et. al. 2017: Building Global Governance for 'Climate Refugees'. 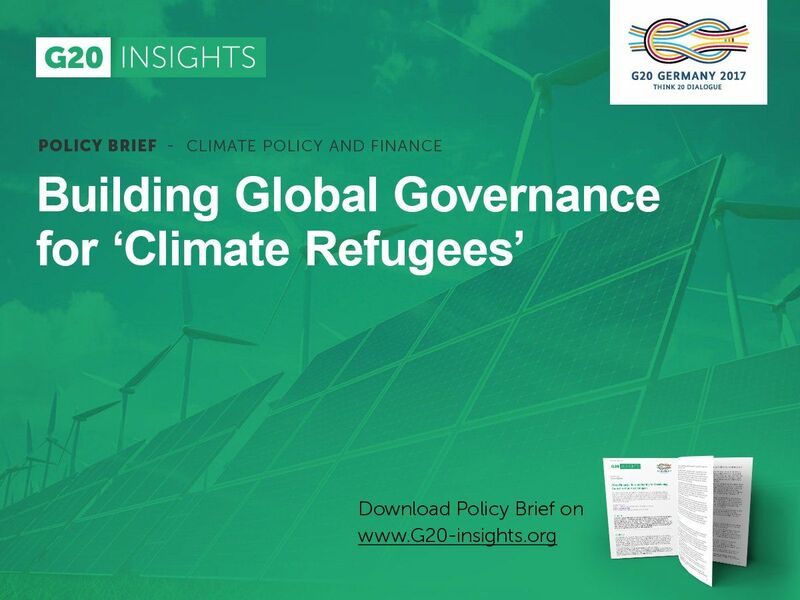 Online: http://www.g20-insights.org/policy_briefs/building-global-governance-climate-refugees/.